When I visit my folks in northern California for short visits, I use the same trick to ward off jet lag that I use in London: I stay on Chicago time. This means, however, that I get up around 5:30 and hike over to the Peet's to work until everyone else wakes up. Combine that with this being the end of August and it really brings home how short the days are getting. At home I've already noticed how gloomy it is at 6:30; here, I'm leaving the house at 5:45, almost an hour before sunrise. The last time I visited California, in May, I walked to the coffee shop at dawn. Today I thought it prudent to bring a flashlight. Chicago has lost 74 minutes of daylight since August 1st, and will lose another 100 minutes by the end of September. We'll also get cooler weather, changing leaves, sweaters, and longer walks with Parker, so it's not all bad. From this he examines scholastic opportunity and achievement, how different ethnic groups approach intellectuals in their midst, and class conflict in general, as only Coates can. It's a good read. First of all, northeast Illinois (Cook and several surrounding counties – see map below) has experienced a shift in precipitation over the last 120 years. This plot shows the amounts for each year as green dots, and an 11-year running average showing longer periods of dry conditions (brown) and wet conditions (green). There is a pretty remarkable shift from a drier climate between 1895 and 1965 with lots of brown, towards a wetter climate from 1966 to present where green dominates. If you compare the average annual precipitation between the two periods, you get 836 mm for the earlier period and 935 mm for the later period. That is a 99 mm increase, or about 12 percent. Of course, we have still experienced drought conditions in this later wet period, as noted in 2005 and 2012. However, the wetter years far outnumber the dry years since 1965. BTW, this pattern is not unique. I have seen this across the state. 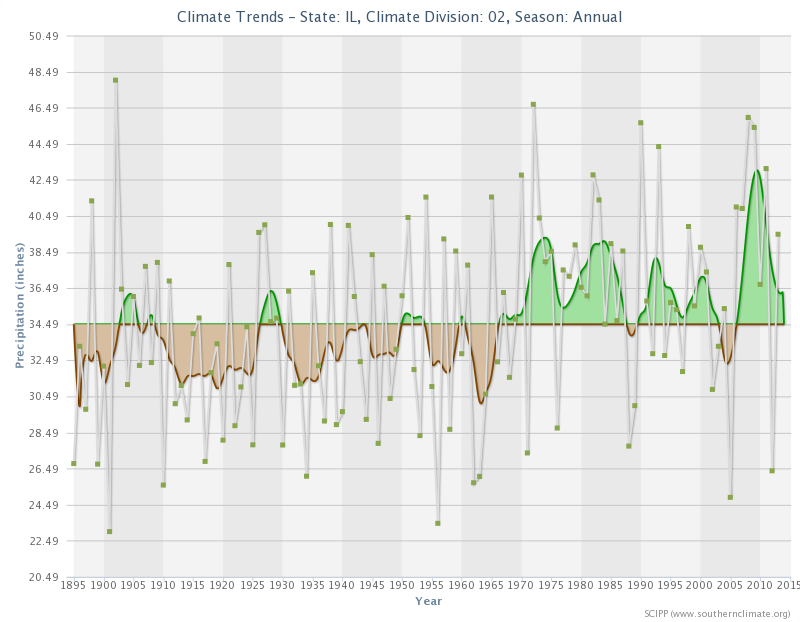 So, with slightly warmer weather, milder winters, and more precipitation, it looks like Illinois might suffer less from climate change than other parts of the country. However, those conditions have led to increasing insect populations and more-frequent large precipitation events, with non-trivial costs. At least we're not in South Florida, which not only faces complete inundation from rising sea levels, but also a climate-denying Congressional delegation. On those rare occasions when I opt for it, I usually enjoy having in-flight WiFi. At this particular moment, however, I'm staring down another two hours of flying time with WiFi throughput under 200 kbps. That speed reminds me of the late 1990s. You know, half the Web ago. This is painful. I'm not streaming video, nor am I connected to a remote server like the guy next to me. I'm just trying to get some documents written. I believe I will have to write a complaint to GoGo Inflight, as this throughput is completely unacceptable. But enough about that minor sadness; I've found something truly horrible. Two things. First, "modern" English in 1946 seems a lot like modern English in 2014. Frighteningly so. I saw something else under the sun. The race isn't [won] by fast runners, or the battle by heroes. Wise people don't necessarily have food. Intelligent people don't necessarily have riches, and skilled people don't necessarily receive special treatment. But time and unpredictable events overtake all of them. I have observed something else under the sun. The fastest runner doesn't always win the race, and the strongest warrior doesn't always win the battle. The wise sometimes go hungry, and the skillful are not necessarily wealthy. And those who are educated don't always lead successful lives. It is all decided by chance, by being in the right place at the right time. NO! No, no, NO! This isn't a children's book. Why does anyone need to dumb it down? I mean, fine, vernacular and all, but can't we at least keep the poetry? It's no wonder the religious right have such poor cognitive skills. The one book they were allowed to read as children has been reduced to pabulum. Only UberTaxi cars can participate, because they're licensed cab drivers. Meanwhile, Illinois Governor Pat Quinn vetoed legislation that would have made it more difficult for Uber and its competitor, Lyft, to operate in Chicago, and Uber is coming under fire for poaching drivers from the competition. American vs. Orbitz: Who's going to win? From everything I understand, this particular spat is really about economics and there’s not some underlying hidden issue. While published commissions have disappeared, agencies with heft like Orbitz still do get paid by airlines. They also get paid by the reservation systems they use. How does the reservation system get the money to pay them? They make the airlines cough it up. So really when someone books on an online travel agent site, the airlines are paying for it twice. The airlines have to look at the total amount and decide whether or not its worth the price to play. Now, if you’re a traveler and you go to Orbitz, you aren’t going to see American or Southwest. ... Sure, United and Delta can pick up some of the slack, but Orbitz becomes significantly less useful domestically. International is a different story, I suppose. That being said, if you really love using an online travel agent, then why not just use Expedia now? There is real risk for Orbitz. There is also real risk for American, but it’s less than it probably would have been in the past. Before consolidation took hold, there were so many airlines out there you might not notice, as a consumer, that American had disappeared. But now, you’ll notice. At the same time, American has upped the percentage of traffic coming direct, so Orbitz really feels more pressure now than it would have in the past. The balance of power has shifted. As a loyal oneworld frequent flier, I almost always go to aa.com directly (though I sometimes follow up by checking Hipmunk when I see suspicious direct pricing). But for occasional passengers, the Orbitz is a useful resource. And if Orbitz no longer shows American Airlines prices, will United and Delta raise theirs? Are zombie bikes coming to Chicago? The goal of this research is to derive algorithms directing the vans and trucks that bike-share operators use to shuffle bikes from station to station within a city. Trouble is, rebalancing is a moving target with several layers of complexity. You not only need to predict how many bikes a station will need at a certain time, but you need to minimize the (costly and time-consuming) movement of these vans and trucks—and you need to do it all while the system is in use. Algorithms aren't the only option. Wald reports that at least one researcher is modeling a system in which driverless bike-share trucks could rebalance stations automatically. Of course, an easier way would be for bike-share systems to use electric bikes that shuffled themselves. But the thought of a bike traveling without a rider does bring up the problem of, you know, balance. Meanwhile, Chicago's Divvy system will add another 100 or more stations next year, all the way up into Rogers Park and down to the far South Side. According to these data points, Republican governors who bucked their party’s stance and accepted the policy are faring better with voters—in these races, an average of 8.5 percentage points better. Mainly, since I'm going there soon, I should have mentioned the 6.1 earthquake in Napa yesterday morning. Also, a few blocks from where I'm sitting, Chicago is building a new river walk for $100 million. Anyone else looking forward to Rick Perry's next political campaign? It should be fun. Oh, and I went with the REI duffel. Someimes—rarely—I disconnect for a couple of days. This past weekend I basically just hung out, walked my dog, went shopping, and had a perfectly nice absence from the Web. Everything you know about the British burning Washington 100 years ago yesterday is wrong. Why are Web-special airfares so rare in the U.S.? There is a major effort underway to scan and digitize millions of historical weather records for climate research. Burger King is in talks to buy Canada's Tim Horton brand, yet another thing we Americans will have to apologize to the Canadians for. Whenever we get around to it. Chicago's Jackie Robinson West All-Stars Little League team lost their game yesterday against South Korea, becoming the runners up in the Little League World Series—which is still pretty awesome.